The truth is the public prefers zero-emission fuel cell buses over their diesel-powered cousin. Transit drivers on routes served by both types of buses (diesel and fuel cell electric) have reported that some passengers prefer to ride the alternative fuel bus, often waiting curbside for the next fuel cell bus to come along, even if the diesel bus is available to board. AC Transit’s The HyRoad program in the U.S. provided insightful results and continues the operation of its fleet of fuel cell buses. "Another thing that's exciting about this bus is the reaction that you get from the passengers. They get on the bus and they're like, "Oh, wow! ", and I've seen passengers do this: when I didn't have the fuel cell bus, I'll pull up. The fuel cell is coming... they won't get on my bus. They'll wait for the fuel cell. So you know, I think they're very pleased. The public really loves the bus." This reaction is just one example of many benefits associated with zero-emission hydrogen-powered transit buses. A happy and enthusiastic public transit ridership should serve as the inspiration for change. Many other AC Transit drivers and mechanics share their personal experience with driving and maintaining fuel cell buses as seen in this video. At present, transit agencies are hesitant to invest in fuel cell buses due to lack of knowledge about available hydrogen infrastructure and refuelling protocols. For example, European bus operators are actively seeking key information and guidelines on large-scale hydrogen refuelling infrastructure for fuel cell bus fleet commercialisation development, which the NewBusFuel study aims to uncover. Furthermore, some transit agency management have visions of a Hindenburg-type incident occurring on the property while a bus is getting refueled. Let’s put that antiquated thought to rest. Hydrogen fuelling systems are indeed safe. Q: Why put an entire hydrogen fuelling system in place if only a few buses within my fleet require hydrogen? A: Hydrogen fuelling systems are completely scalable. There are solutions for every situation. For example, Transport for London (TfL) is aggressively embracing a fuel cell solution to propel its bus fleet in the UK. 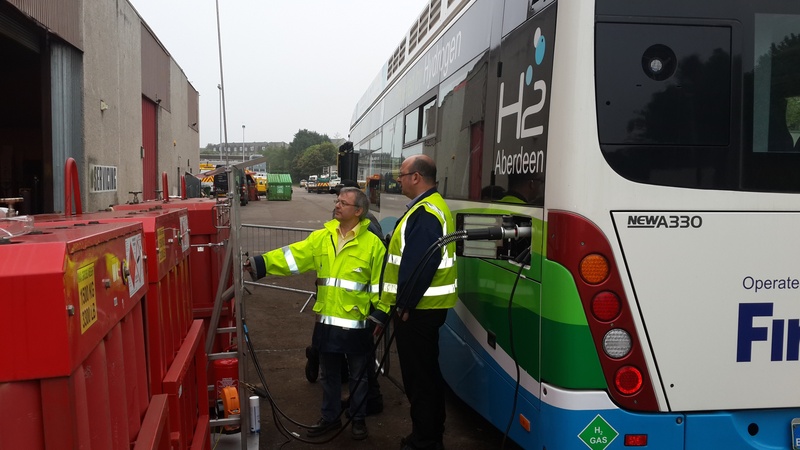 The hydrogen supplier, Air Products, has installed a bespoke refuelling facility, specifically designed for the needs of TfL, and supplies onsite fuel pumps, similar to those found on conventional fuel station depots. The refuelling equipment and hydrogen storage is owned and operated by Air Products. Air Products delivers hydrogen from its liquid hydrogen production plant outside of the city, using a specifically-designed hydrogen delivery vehicles called a Hydra. The Hydra replenish on an as needed basis depending on usage. As the fleet expands to larger number buses, the model has evolved from a delivery service to on-site manufacture of hydrogen. We believe processes like these eliminate the concerns of complexity, reliability and the required real estate associated with the implementation of these fuelling systems. The deployment of compressed natural gas (CNG) as a fuel in large transit bus fleet depots has demonstrated the scalability, safety and operability of gases (like hydrogen) as a fuel for transit buses. Q: OK then, let’s talk about refuelling times. Diesel buses are quick to refuel. No fancy equipment is required. Just roll up to the pump and start the process. A: The refuelling time for a hydrogen fuel cell bus is less than 10 minutes and is very similar to CNG systems many fleet operators are familiar with. The protocols are in place for safe and efficient refuelling. This is in line with diesel buses. The distance travelled on a “full tank” of hydrogen is within the same range as a diesel bus, which makes this technology so appealing. Route flexibility and operability remain as robust as with diesel-powered buses. 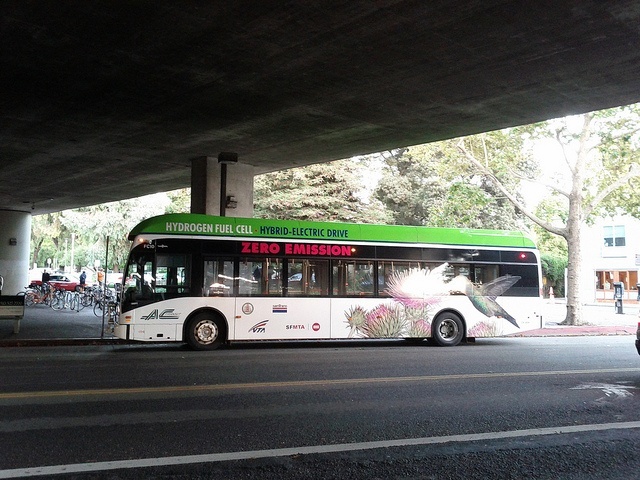 Getting back to the riders who prefer the zero-emission fuel cell buses. It’s not just an environmental statement they make by preferring these buses. Fuel cell buses are simply better: they make less noise, smoother acceleration and softer braking—these are the hallmarks of a fuel cell bus. The time has come to have a serious review of the propulsion systems that power our public transportation networks. Please participate in the conversation and leave a comment below. Zero-Emission FC Bus Deployment & H2 Fueling in the U.S.